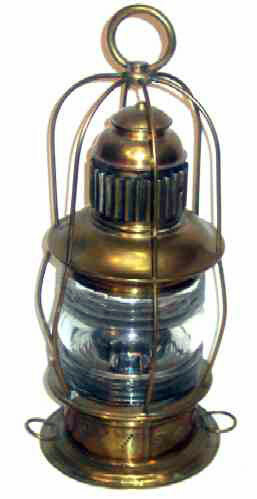 Presented here, a VERY RARE and Complete, Original (Except for the lens) Brass, U.S. Oil Burning "Guards Over" Anchor Light. The vertical "corrugated" venting system with the double brass cap on top dates to the mid 1800's. Probably burned whale oil originally. It is assumed the Fresnel lens replaced the vertical ribbed or plain glass that would have been original to the piece. The lamp is 15 inches tall and is in absolutely beautiful condition.